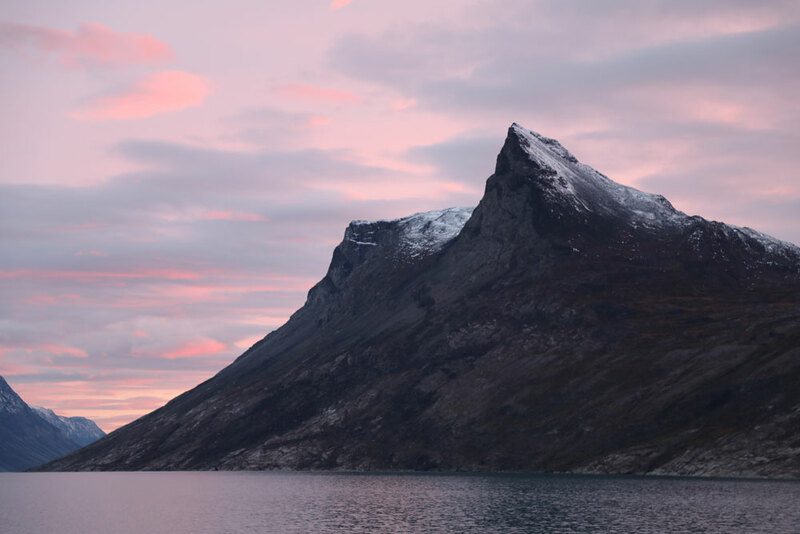 On our last Arctic expedition of the year in Baffin Island, our onboard resident storyteller, Phoebe Smith, worked with One Ocean guests to help them record their most special moments from the trip. Clouds diminished allowing our first glimpses of the mighty ice shelf. Ridges and crevasses began to reveal themselves between the jagged mountains poking through. 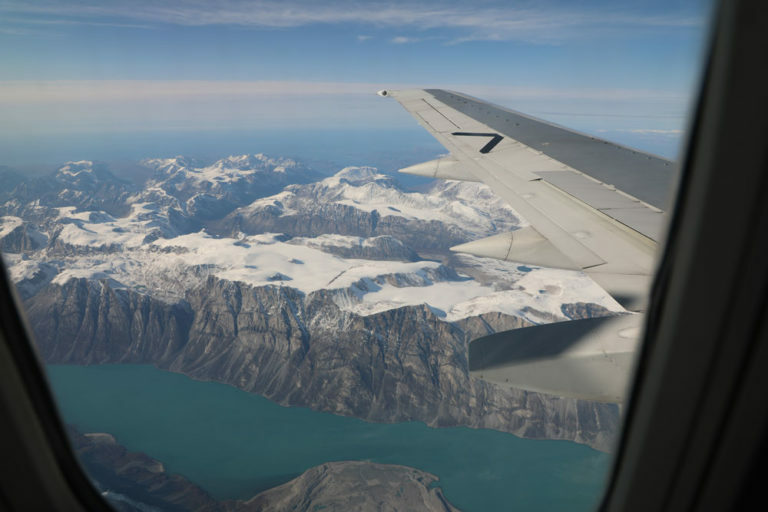 This was the view from our flight to Kangerlussuaq where we would begin a 10-night exploration of the Arctic. The lower we descended, the more we appreciated the huge, inhospitable icescape that appeared beneath us, before it was obscured by patches of low cloud. Our Airbus turned into the steep-sided fjord. With engines powered up, gear and flaps down we fixed on the glideslope. The cold grey of the fjord gave way to alluvial sands, then the tarmac flashed below. We braked hard on the uphill runway and came to a halt on the small apron. This was our dramatic arrival in Greenland and our first sense of its chilly autumn air. The mud room was a sea of unfamiliar faces and awash with unrecognisable voices that surged towards me like a veritable sound tsunami. It had been a long day. I was tired, hungry and alone. My profound deafness makes verbal communication difficult – frequently impossible. I consoled myself that I had arrived at my destination airport, unfortunately, my transfer transport had not – yet more problems ensued. Eventually, I made it to the ship. I was on board at last. Suddenly out of the tempest, floated a cheery, familiar voice (a member of One Ocean Expeditions staff on my adventure last year) said: “Wonderful to see you again Gwen!” and a huge hug engulfed me. No longer isolated, I belonged. The landscape is a patchwork of fall colours – red, orange, yellow and brown. The mighty Jacobshavn Icefjord lies stocked full of ‘bergs within easy walking distance. Yet I am lying prostrate across the boardwalk that leads me to it focusing all my attention on the stalk of a cottonweed that stands tall above the showy tundra vegetation. It is silent – absolutely and perfectly silent – and I am totally alone in the vastness of West Greenland. Gradually, though, I hear the swish, swish that accompanies an approaching traveller. I turn my head, start to struggle to my feet, and as I do I hear laughter. In English, spoken with a thick Russian accent, a voice says: “Don’t get up! I want to do the same. 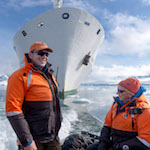 I’ll take a photo of you and you can take a photo of me.” It is a fellow passenger on board One Ocean Expedition’s Vavilov ship, only she is a research scientist. I return to my position as we both laugh at the incongruity of the situation. We swap positions and I take her photograph in return and we plan to share the pictures later. I leave and now it is she who is lying prostrate on the boardwalk, while I walk over the crest, alone once more in the magnificent scenery, swish, swish, swishing back towards the town. It seemed impossible that a complete 360 degrees of vision could contain all that I could see: a coruscating landscape of sea, rock and ice, set against a clear blue sky. 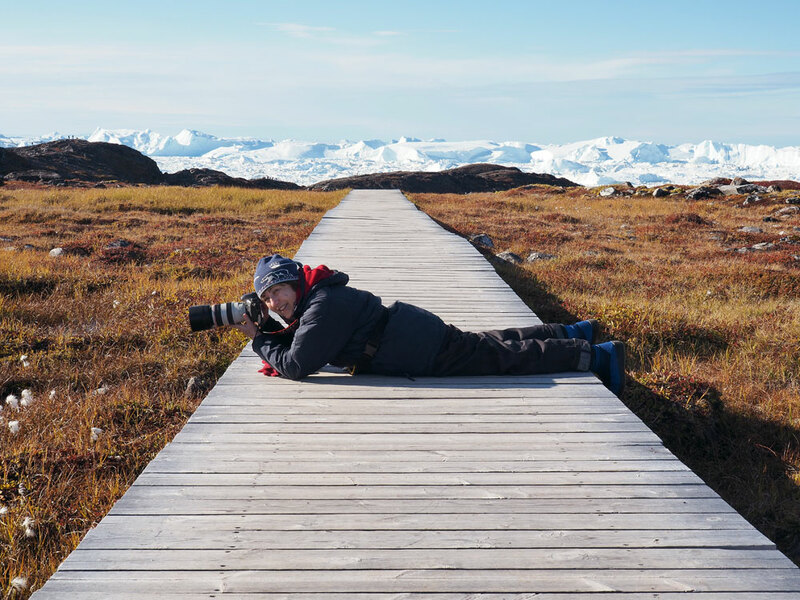 But a boardwalk and uphill clamber at Jacobshavn Icefjord, a UN world heritage Site in west Greenland, can elevate you to such a breath-taking panorama. With the gentle winds and occasional rumbles of calving icebergs, I was reminded of my place in existence: a small observer of vastness; but by no means feeling diminished by it, by beholding it, I felt lord of it all. Sometimes, it can take only a short walk to find yourself in a world apart. Past the dogs slumbering in the sun; past the cemetery where neat, white crosses gleam in their rocky clearing; down the boardwalk snaking across low vegetation in glowing autumn orange and red; up the rocks that have been scoured by a long gone glacier; there, below, we reach a huge, shining, icy river – in the Greenlandic town of Ilulissat. Ice in all shapes and sizes tumble together, hardly able to move, shine and sparkle in the sun, while above the sky appears an iceberg blue. 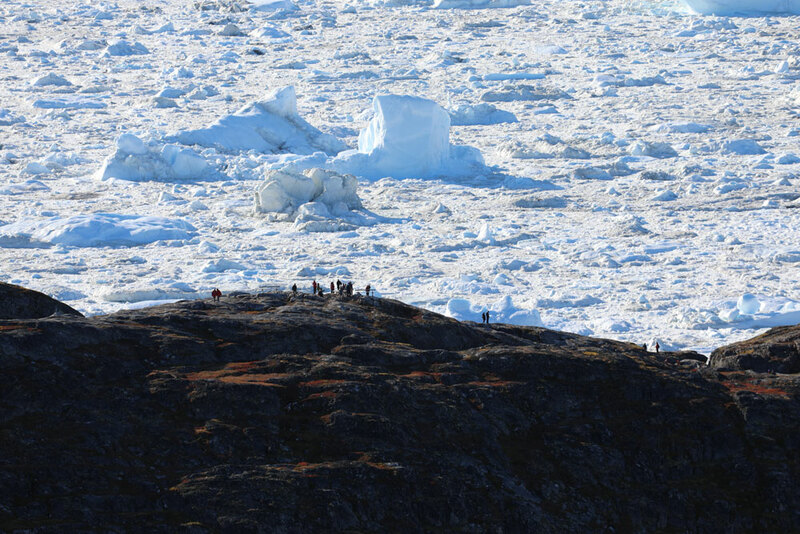 Standing on a rocky promontory, with a huddled group of fellow travellers, we strain to look through binoculars for a glimpse of whales spotted amongst the towering ice in the bay. Ice, whales, rocks, sky and us looking in here, high in the Arctic. Here there are giants. 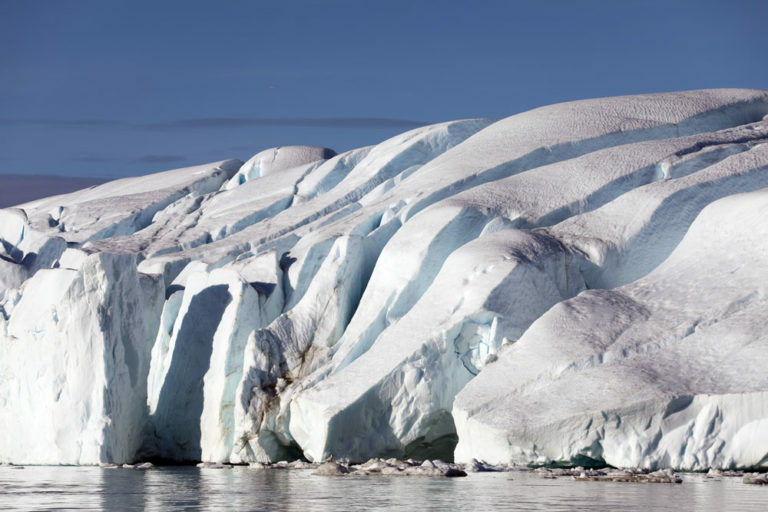 Spawned by a glacier, 70km to the east, towering icebergs are now trapped in a melange of shattered pinnacles and columns, bound together by sea ice. 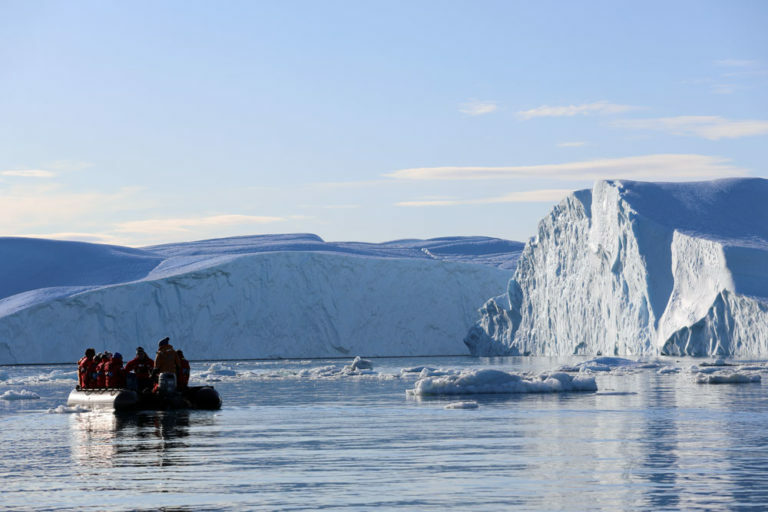 We are in Disko Bay, on day three of our Greenland to Baffin Island trip, and watching while new, smaller icebergs are birthed again into the waters on the edge of the town called Ilulissat. On our hike to get to the UNESCO World Heritage Site of Jacobshavn Icefjord the landscape we pass through is filled with colour. 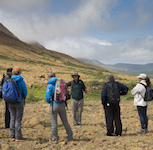 First the reds and yellow of Arctic willow and dwarf birch. Then the blue on blue of sky and sea followed with flashes of turquoise from the depth of white icebergs. The signs along the way warn us to stay away from the beach, due to the risk of a tsunami that can occur when a giant rolls or cracks to birth its own monstrous child. Finally, we reach the headland where we are treated to the full view of the mouth of the icefjord. Here the silence is broken only by the distant cracking of the Giants as, one by one, they wake from their sleep. 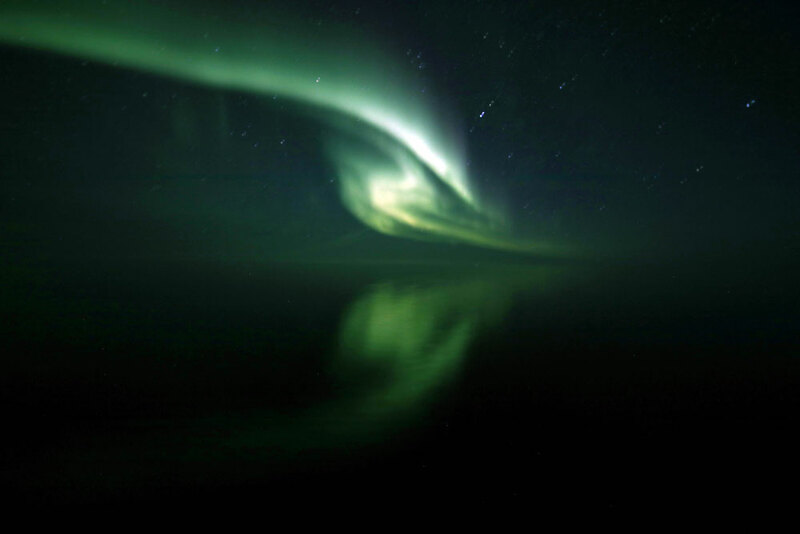 It looked exactly like a singing seal – a harp seal of course – its head turned to the sky, mouth wide open. Standing here in Qeqertarsuaq, on the west coast of Greenland, it was the first time I had ever seen icebergs. And as I gazed upon them, I couldn’t help but see more than just frozen water – they all seemed to resemble something else. Behind the one that looked like a seal was the famous James Caird ship with full-blown gale behind him filling out the sail. While coming up on the starboard side was a 747 airplane ready for take-off. However, nothing prepared me for what I then saw out of the corner of my eye – an alligator with only one leg. 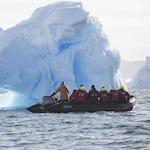 Such is the awesome excitement to be experienced when you travel in the path of polar icebergs. Much like the singing seal, I too stood there frozen with my eyes wide open. How amazing – all I said was ‘Qauna’ (pronounced koyennar) the local word for thank you. Thank you for the smiles and friendly assistance that transcended language barriers. 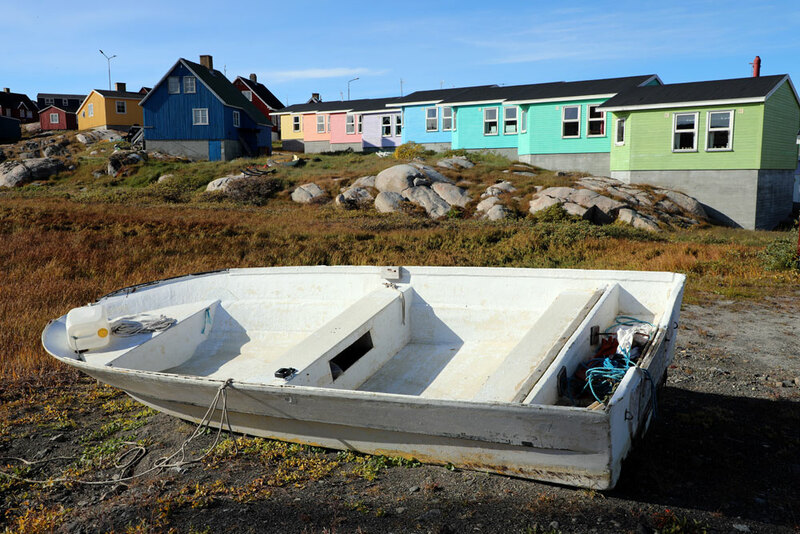 Thank you for the beautiful town of Qeqertarsuaq – where every flat rock was topped with a brightly coloured house, compact and white-windowed. Washing was flapping in the warm breeze, while poignant memorials were present too, recalling fallen sailors and local heroes. And, beyond the black beach, craggy icebergs standing sentinel, seemingly protecting the town. Thank you for the myriad fishing boats bobbing in the harbour, the springy tundra and towering rocks with their near-vertical scree slopes. Perhaps most of all, thank you for the silence. Qauna. swirling arabesques into the night sky. at the inky dancing floor. 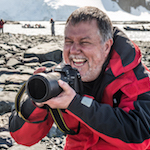 It can be a burden to be an introvert on a ship full of apparent extroverts, and it is why I travel by ship only when necessary – such as on polar journeys. However it can also lead to unexpected and touching moments. On a previous trip to Antarctica, birthdays were celebrated with great fanfare. I find it enjoyable when someone else is the centre of attention, but it makes a shy person like me cringe. So one of the first things I did when I boarded the Vavilov ship was find the hotel manager and derail any similar plan for when I turned 69 on this voyage. My request was respectfully granted. 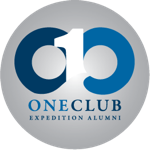 Then, after dinner, following a great day of hiking along the coast of Disko Bay, I returned to my cabin to turn in for the night and there awaiting me on my desk, was a beautiful cake and a note from the One Ocean Expeditions team wishing me a happy birthday. 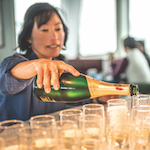 It was a thoughtful and touching end to another wonderful day at sea – and delicious too! “Why go to Greenland and Baffin Island?” is a question I was frequently asked by my non-Polar friends, pre-trip. The answer, I thought, was simple. 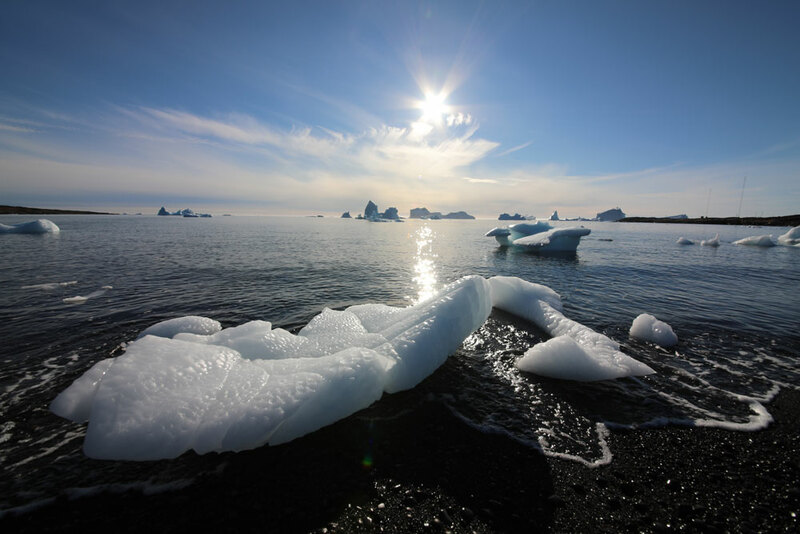 We would explore Inuit settlements, look at fauna and flora, and learn about geology, glaciology and icebergs, not to mention travel by zodiac from the ship. 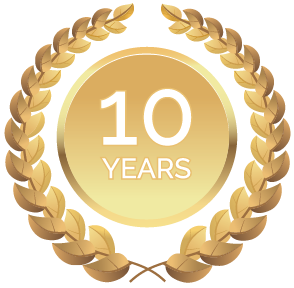 The list sounded impressive – and a lot to pack into 10 days (never mind 100 words) – but what I didn’t realise is that there was more still. Each day there would be talks and presentations, adding an extra dimension to the experience. I was intrigued by stories of historical expeditions and discoveries, each one as exciting as the last. But there was one that particularly stands out in my mind, sponsored by Booth – the gin maker in 1829-1833 and namesake of the Boothia Peninsula and the Gulf of Boothia north of Baffin Island. It certainly was memorable just so long as, in my case, you take notes – and lots of ice with the gin! Our sincere thanks to Phoebe Smith for sharing her story-telling skills onboard and helping our guests to capture their special memories through the written word. We hope to see you again! 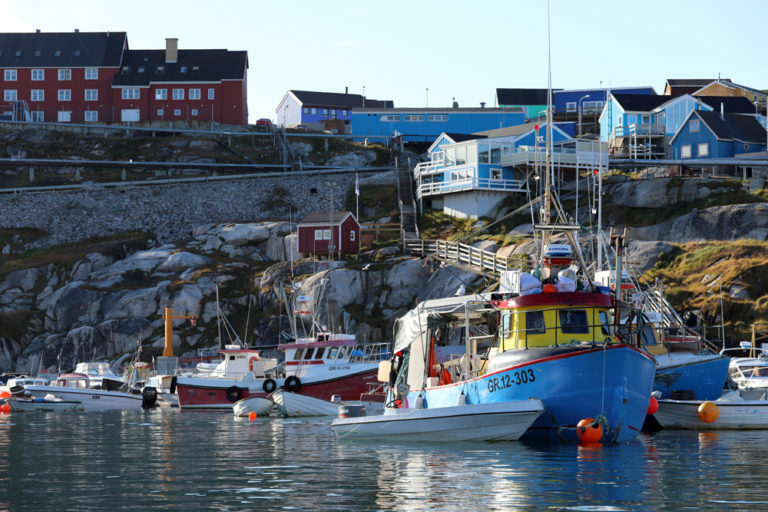 For more information on the Classic Northwest Passage & Greenland voyage click here. Next Post What is the One Ocean Difference?